In this era of globalization where the world can be shrinked to fit into a television set or on a table or even a cell phone, it is important to look at the documentary film movement in India as placed within a larger universe. Indian documentary film making tradition dates back well before independence, and has carved a niche for itself in the nonfiction genre world with its creativity and hard-hitting works on subjects ranging from Indian arts and social concerns to natural history. Traditional Indian images of the Taj Mahal, droughts and poverty-stricken villagers have given way to films covering a spectrum of social, societal, environmental and human issues facing India. Films on issues such as human rights, censorship, gender roles, communal politics, individual liberty and sexual identity form the new Indian documentary filmmaking community. SAGE Publications recently came out with a book “Filming Reality” on the subject. The book explores the independent documentary film movement in India post-1970s, when it began to acquire an identity of its own and many films got worldwide recognition. It analyses notable documentaries made over the last four decades, including those by iconic film-makers such as Satyajit Ray, Mani Kaul, Anand Patwardhan; activists such as Rakesh Sharma, Ranjan Palit, Amar Kanwar; feminists such as Deepa Dhanraj and Madhusree Dutta; and auteurs such as Sanjay Kak, R.V. Ramani and others. The author, Shoma A Chatterji says, “In India, mainstream cinema is celebrated and promoted and awarded across the world and documentary cinemas are discarded by the wayside; even then Indian documentary film making remains the most dynamic and ongoing form of Cinema known to the world”. The Independent documentary cinema is alive and flourishing every passing moment. It refuses to be killed, injured or damaged for stringency in funding, scarcity of exhibiting space, distribution support and so on. This several years old movement is going ahead despite the pitfalls, struggles and blocks—financial, political, and administrative—besides the lack of necessary distribution platforms. 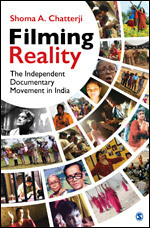 To read more on the Independent Documentary Movement in India grab your copy now!